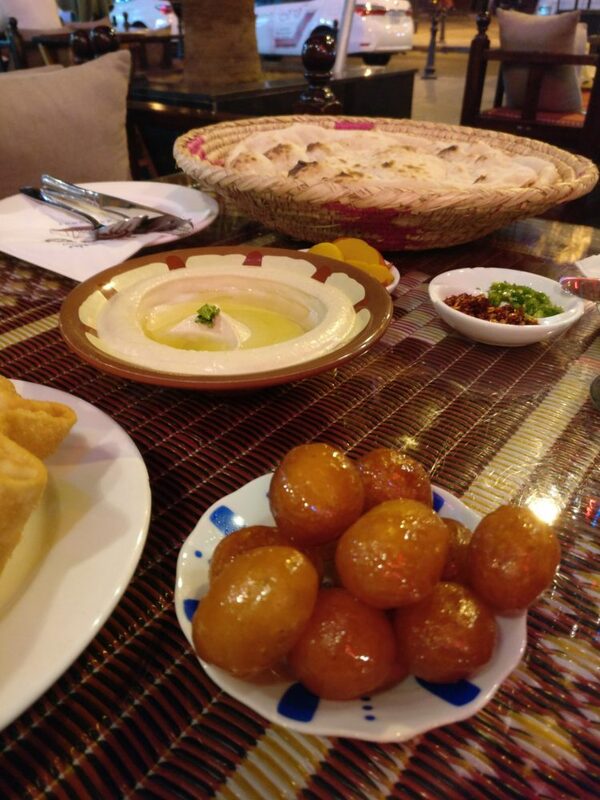 As two colleagues and I sat down at a restaurant in Kuwait City in the evening, looking forward to a relaxed meal, a man at the next table spoke to us. A small man with uneven teeth and a thick mustache, he wore a traditional robe called a dishdasha and a headdress. He started with “Hello” and asked where we were from. Answering politely – Holland, Switzerland, and the US – we turned to our menus, not wanting to be stuck making polite conversation with a stranger for too long. Our waiter, however, when we were almost done with our meal, told us that the man who’d spoken to us is a celebrity: a film star, no less. His name is Nawaf Al Shammari. 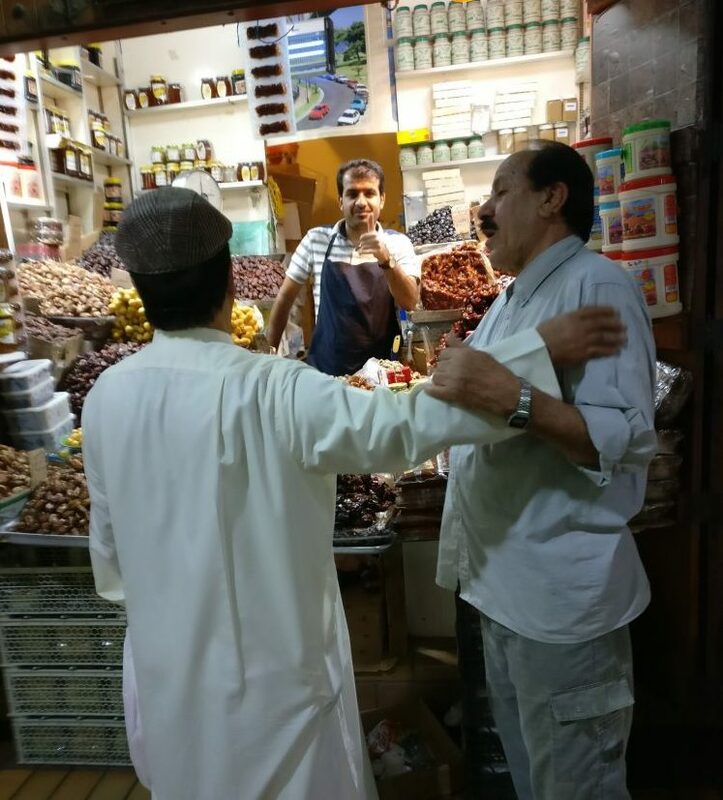 The man was now drinking coffee with friends – alcohol is not sold in Kuwait – but he noticed our renewed interest, and we ended up taking pictures of and with him. He came and sat at our table for a few minutes, seeming delighted that we now knew who he was, and kept repeating “Remember my name!” The conversation never got beyond some joking pleasantries, since his English was fairly limited. Given my astounding ability to forget names, I quickly googled him and, sure enough, he has a list of film and TV credits. This was my second and final evening in Kuwait, and I was scheduled to fly home that night. Both evenings I had walked with colleagues around the center of the city, where the highlight seems to be shopping in the souk. After the heat of the day, the temperatures in the mid-30’s Celsius were a welcome relief, and it looked like everyone was out and about to do their shopping or just take a stroll. The souk, or marketplace, was rebuilt, like the whole city, after the Gulf War in 1990-91. Despite its newness, it has an atmosphere much like souks I’ve visited in other Middle Eastern countries: Egypt, Israel, Dubai. At the same time, it’s somehow more pleasant because the lanes aren’t narrow, and I never felt too crowded or closed in, as I sometimes did in other markets. The pavement is neat and well-kept, with some artful lighting embedded in it. 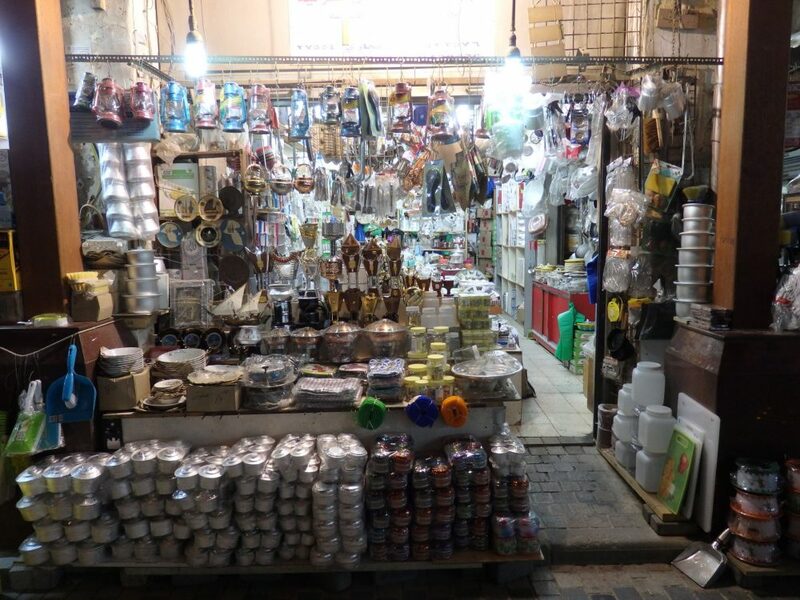 The shops in the souk are grouped according to what they sell: clothing, jewelry, meat, fish, vegetables, housewares and so on each have a separate part of the market. The market-sellers were not at all pushy, which I appreciated, so I could eye their wares without feeling pressured. I could get a general sense of what was available and, of course, I especially enjoyed peering at the spices, fruit, and so on that I couldn’t necessarily identify. This market trader spotted me snapping a picture, but didn’t seem to mind. The people-watching is as fascinating as the wares in the market, since so many nationalities are represented in Kuwait. Like Dubai, much of the population comes from elsewhere to work in Kuwait. Only about 30 percent are actually Kuwaiti. In the market, this range is visible, not so much because of skin color or other physical characteristics, but because of the range of outfits. Below is a short piece I recorded as I walked through the souk that will give you a glimpse of how it looked. Pardon the shaky filming; I was trying, probably unsuccessfully, to be inconspicuous. While many men were dressed in casual, Western clothing – shorts or slacks, with a t-shirt or polo – the Kuwaitis were mostly, like our movie star, clad in dishdashas, and on their heads they wore white headdresses called gutra, held in place with an ogal, a sort of rope around the head. Others, clearly servants, wore red coveralls and pushed shopping carts, following along behind their bosses, ready to take care of any purchases. The women, though, showed the greatest variety. For one thing, I never realized that headscarves come in so many styles and can be tied in so many different ways. Some had double-layered scarves, with a white one underneath and a gauzy, transparent one on top. Some had long, flowing scarves, while others were tied tightly around the face. The amount of hair that was visible also varied widely. I also spotted a few women without headscarves. Some women wore Western dress, though on the conservative side, with at least three-quarter sleeves and no deep necklines or short skirts. Most, though, wore long, floor-length robes, but these came in an array of patterns, cuts and colors, sometimes showing stunningly beautiful workmanship. Others wore saris or long tunics over trousers. I saw many women wearing an abaya, a long, loose, black robe, along with a black headscarf covering every hair on their heads. Some wore a burqa, which covers the face as well, except for a slit for the eyes. 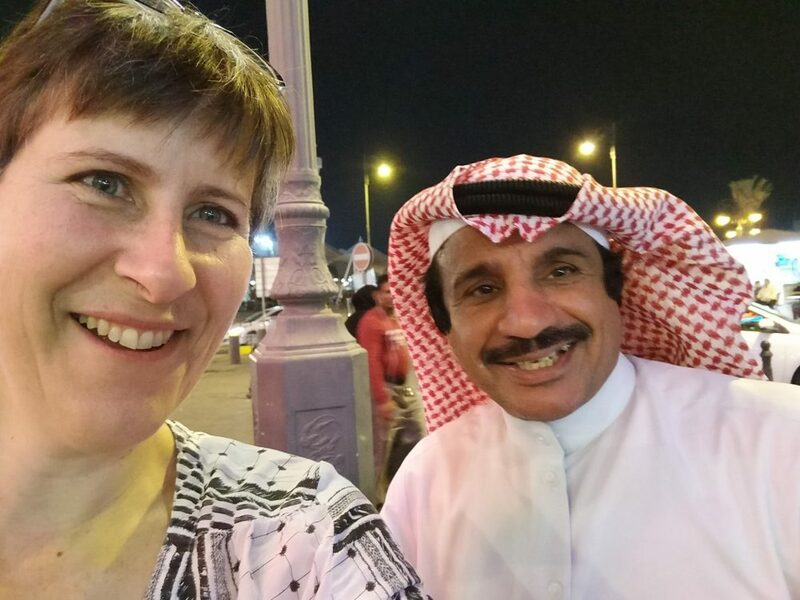 The first evening I went into the souk, I was with one colleague. We strolled around until we found a row of restaurants outside on a plaza. It was simple enough to choose: we went with the one with the most customers. We had Indian main courses – mine was a hard-to-chew, but tasty, mutton dish – accompanied by homemade pita bread and hummus. That, along with our drinks (lemon mint: yum! ), came to a grand total of the equivalent of eight euros. The second night as we (two colleagues this time) crossed the market, a random stranger asked if we were looking for something in particular. We told him we were looking for a place to eat. He recommended a restaurant right near where we had eaten the day before. We assumed, though we didn’t ask, that he was sending us to a friend’s or relative’s restaurant, but we didn’t care. We went anyway. That restaurant turned out to be a bit more upscale in appearance. Instead of plastic sheets covering the tables, this one had glass tops on heavy wood tables. The seats were cushioned, and the service was distinctly more attentive. And they had movie star clients! Yet a similar meal – Indian-inspired food, plus hummus and baba ganoush and pita, accompanied by more lemon mint and followed by tea and coffee – cost us the equivalent of twelve euros for the three of us. The first part of our meal: hummus in the center, freshly-baked pita behind it, and those balls in the front are some sort of slightly sweet fried dough. Strolling, both before and after dinner, with no headscarf and dressed in fairly conservative Western clothing, I was not aware of anyone expressing disapproval of my uncovered head. As a matter of fact, we seemed to pass through the busy city center almost unnoticed. This is clearly not a place that is accustomed to tourists, or that depends on tourism for their livelihood. No one hassled me in any way, even when I entered, for example, jewelry stalls, asked about prices, and then excused myself and left. Well, except for the movie star, who did flirt a bit. And a waiter, who put on an entertaining show of pouring coffee that we hadn’t ordered. 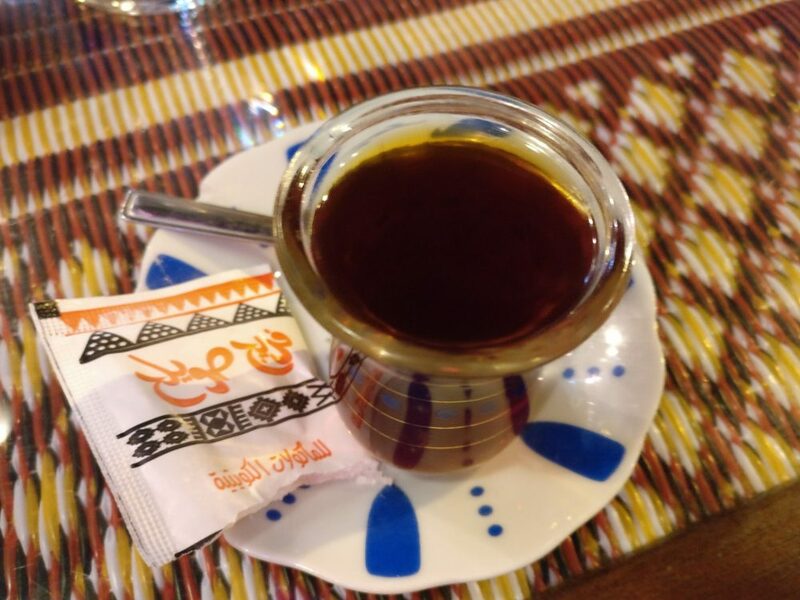 We didn’t mind; one of my colleagues quite enjoyed the coffee, which was heavily flavored with sugar and cardamom. I ordered tea after dinner, and it turned out to be a tiny glass of the strongest tea I have ever tasted in my life. With a heavy dose of sugar, it was delicious. And the caffeine helped me stay up long enough to catch my 2 a.m. flight. I went to Kuwait to lead a two-day workshop, so I spent most of my time inside a meeting room. My only free time was in the evenings. My main goal the first night was to eat dinner and then get some sleep, while on the second night it was to eat dinner and find a way to stay awake for my 2:00 a.m. flight. 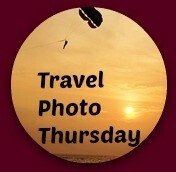 Have you been to Kuwait and, if so, what would you recommend to visitors? Looks like you found a great way to stay awake in the souk! I liked the newly rebuilt souk with its wide lanes and feeling of space for pedestrians with the small and intimate shops. And such an infinite array of things to buy and time to look without being hassled by the sellers. 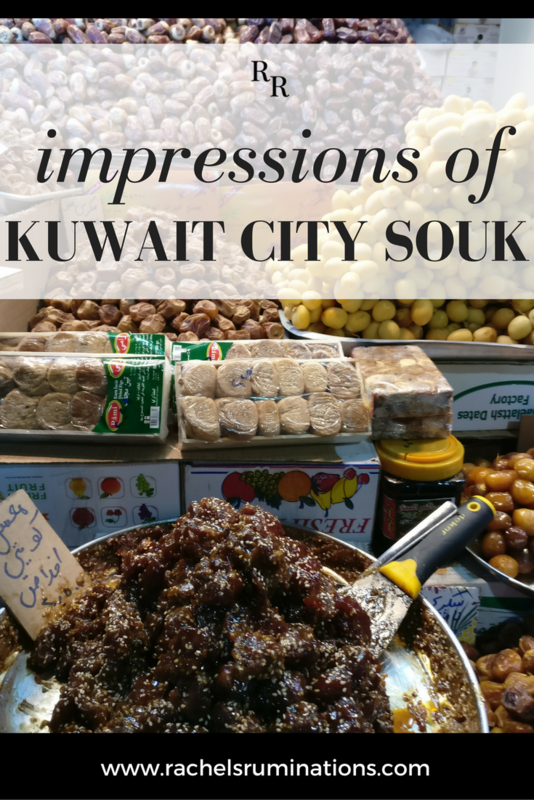 Although Kuwait has never been on my travel radar, I found this post fascinating as it was a glimpse into an country I know little about except from past news stories. Thanks Rachel! I know! I pictured it as this destroyed city with oil wells on fire, billowing black smoke into the sky. But that was a long time ago. I’ve never been to Kuwait. Sounds like a unique experience. And sounds like the people were friendly. I’ve never been to Kuwait and it’s not particularly on my “want to visit” list. Maybe after I make it to Antarctica. Haha! It wasn’t on my want to visit list either. I just agreed to go there to lead the workshop. I haven’t been to Kuwait but your description reminds me of some other gulf states I’ve visited. I love that part of the world, with the colour, the food and the friendliness. I had a similar experience to yours in a back street cafe in Al Ain, UAE, where the locals made their welcome clear with gestures and smiles. I enjoyed every word and image of Kuwait. I was reminded of my recent trip to Jordan and my adventures there. Thank you for an excellent post!! Thanks for the kind words, Marilyn! Even a short time in Kuwait City would be super. Envious of your time there. Great post. Yes, they’re fried and then dipped in a sugar syrup of some sort. Kuwait City doesn’t seem to have much to attract tourists, but I was charmed by the souk area and how everyone was just going about their business rather than bothering with us.